Designed to install and remove the bottom bracket bearing housings Campagnolo and Fulcrum Ultra Torque®. Levers forged steel extractor have flattened ends to fit securely in the bearing while the remainder of the apparatus exerts a strong pull in order to remove it. The installer comes perfectly fit the bottom bracket axle and the bearing, thus ensuring a safe and accurate assembly. 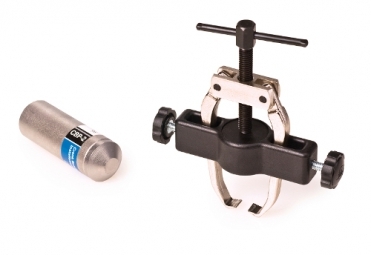 Simply push the bearing along the axis using the tool and a hammer.